Traditionally the pots and the other items are made on the wheel. Clay is the main raw material which is found locally. Crafts persons design their items over the spinning wheel using the magic of their hands to shape up the products. Shaped products are kept for drying and then red colour coating is applied. 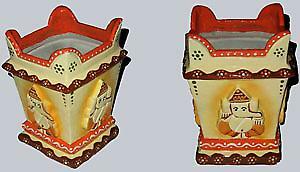 Decoration over these pots and the other eathern items is done only by the women folk. The motifs designed are geometric along with figures of fish, herring bone and scorpions are always painted in the black and white shades.